Rocky Road is a 2-vs-2 minigame found in Mario Party 6, and it returns in Mario Party: The Top 100. Its name comes from the ice cream flavor, "Rocky Road". 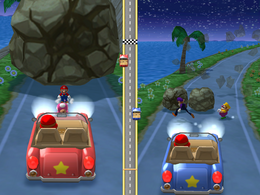 There are only aesthetic changes between daytime and nighttime in Mario Party 6. The Shy Guy (Toad in Mario Party: The Top 100) driving the car is driving along the road, then stops when it pulls up to the first set of boulders. 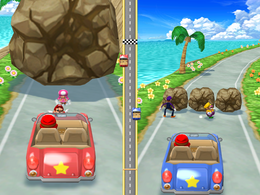 Both teams have to destroy the boulders on the way and go to Shy Guy or Toad's car so the car will advance. Players must be careful not to accidentally hit the other player; in Mario Party 6, accidentally hit players are stunned. If one player is stunned when the team can advance, the one player stands in front of the car and must wait for their teammate to recover. There are five sets of boulders to pass through: two small ones at the beginning, followed by one boulder, then three boulders, then two larger boulders, and finally one massive boulder. The team who reaches the end of the road wins. The winners continue down the road in their car while waving out the window. In Mario Party: The Top 100, Toadette, who is waiting at the end, hops in the car before Toad drives off. 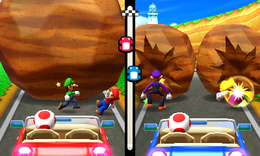 Rules – "Team up with a partner to bust apart boulders that are blocking the scenic road! The first team to reach the goal wins!" Advice – "Be careful not to punch or kick your partner!" Description – "Break down the boulders blocking the road and be the first team to the goal!" On-screen – "Break down the boulders to get back on the road!" This page was last edited on August 4, 2018, at 10:14.